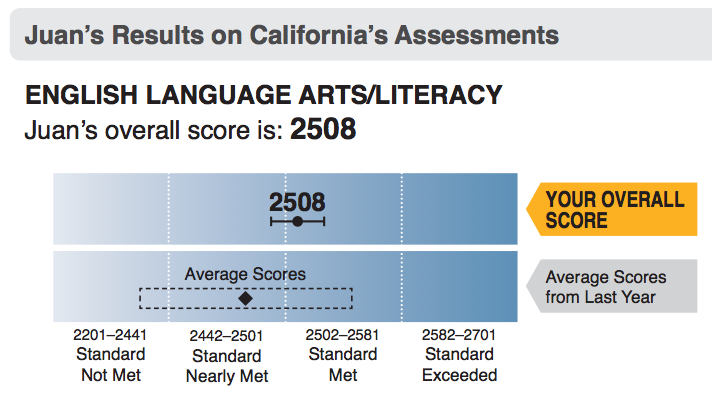 EdSource, on Educational Testing Service’s work scoring SBAC exams in California. 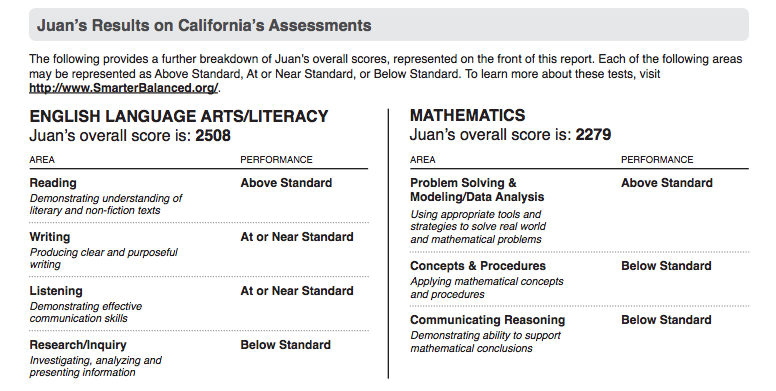 The New York Times, on scoring PARCC and SBAC exams, and Pearson’s work scoring PARCC exams in San Antonio. In scoring related news, see The Seattle Times on unexplained delays in SBAC scoring, resulting in student scores not being available three weeks after completion of testing as promised (HT: Truth in American Education). 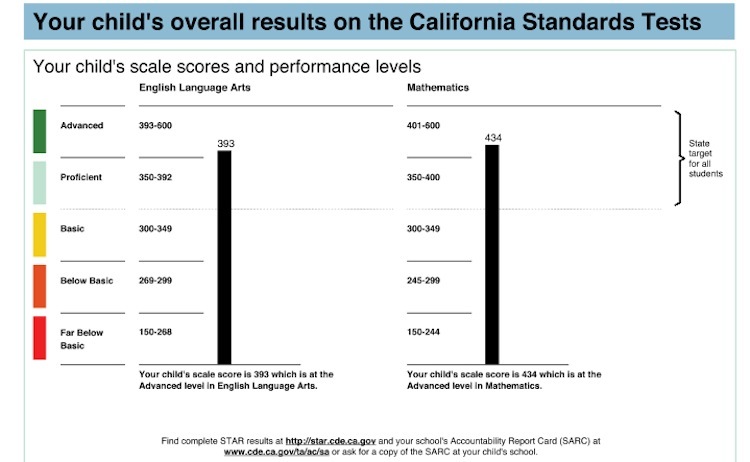 The graphic above shows a sample pre-SBAC report, with sample SBAC reports shown below. The Iowa Assessment reports I receive contain more information than any of these sample reports. College and career readiness information won’t be available until eighth grade (see SBAC models here, HT: Joanne Jacobs). Technical glitches and participation rates. EdWeek reports that following technical glitches this spring, only 37% of Nevada students and 76% of Montana students completed computer-based SBAC tests in ELA and math, and only 88% of North Dakota students completed paper or computer-based SBAC tests. As for participation by states in SBAC, EdWeek reports that Missouri and Maine are dropping the Smarter Balanced assessments, and Connecticut may no longer require high school juniors to take the Smarter Balanced assessments. This entry was posted in assessment, CommonCore, SmarterBalanced, transparency on June 26, 2015 by Karen W.
A new Iowa Administrative Rules website was launched today. The website provides an opportunity for viewing and commenting on noticed (proposed) rules prior to adoption, which should be more convenient than following or searching multiple agency websites to look for noticed rules. In my experience, public comments (or lack thereof) are noted and noticed rules are sometimes changed prior to adoption based on public comments received. In other words, it may be worthwhile to comment on noticed rules. The website also provides a Frequently Asked Questions page and a list of state government organizations, including links to the websites, agency chapters, and agency rules. These last two links should make finding rules easier. Here’s the Department of Education organization overview page. If the DE had any Notices of Intended Action (noticed or proposed rules open for comment), they would be listed on the left side of the page (where it currently reads “No Publications Found”). I’ve added links to the open notices and DE pages near the top of the right sidebar under Admin Rulemaking, and a link to the website home page (Iowa Administrative Rules) under Iowa Government. This entry was posted in DE, transparency on May 18, 2015 by Karen W.
The questions and answers are interesting. How good is the information that Florida districts are technology ready for computer-based assessments? Answer: perhaps not very, as some superintendents reportedly told a senator that they felt pressured to certify readiness, even though they aren’t ready and expect to have problems administering the assessments. What’s the plan if Florida districts aren’t ready? Answer: we don’t have one. As it happens, the Iowa House Committee on Education heard from DE Director Brad Buck last week. What did he talk about? Did the representatives ask good–tough and probing–questions on behalf of their constituents? Or did they just ask easy–softball–questions? How good were Director Buck’s answers? What topics were discussed and what was the quality of that discussion? It isn’t easy for members of the public to attend committee meetings. Unlike lobbyists and Des Moines-based government employees, we may need to arrange to take most of the day off for travel to Des Moines and back while hoping that the meeting we wanted to attend hasn’t been moved or cancelled. This isn’t easy for many of us to do on short notice. The Assessment Task Force report is expected to be presented to the Iowa House and Senate Committees on Education this session. Will tough and probing questions be asked? Will good answers be provided? One hopes so, but how will we know? This entry was posted in assessment, DE, legislators, open meetings, technology, transparency on January 27, 2015 by Karen W.